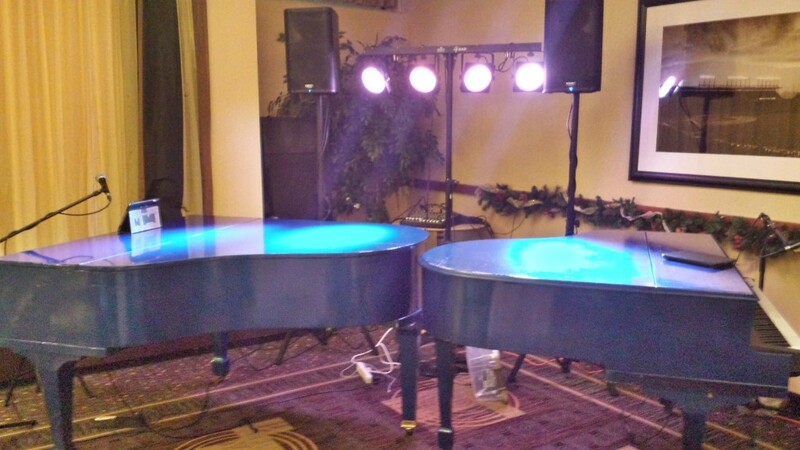 Emily and I played a great dueling pianos show at Harry Caray’s restaurant on December 14th for Press America. We had one goal for the night: get people to dance! We were told that this would be a difficult task. Our client told us they weren’t really a dancing group but that she hoped we’d make it happen! We started out the evening with some background music while the guests mingled and enjoyed some cocktails. Normally at this time of the year we’d do a mixture of holiday tunes and jazz, but we were told ahead of time to “not play any holiday tunes or jazz.” That sentence was meant to sound funny. Not sure if it worked. Instead, we played some cool arrangements of non-jazz/holiday tunes, including some sultry Beatles and Elvis songs. Emily even busted out her guitar. They seemed to enjoy knowing I had learned both of those songs that morning just for them. That’s one of my favorite parts of this job. My clients’ taste in music always helps me learn new songs. Finally we closed the show and everyone applauded, and they asked for one more. I told them I’d only do one more if they all promised to dance. They all groaned, as I had been making this same joke all night. I went into “Hey Jude” and they immediately all stood up and took to the dance floor. It was a great final moment.